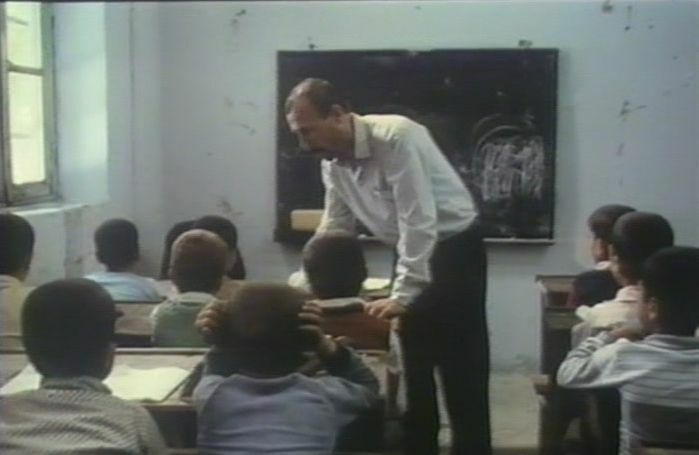 Iranian director Abbas Kiarostami began writing and directing films, both features and documentaries, in the 1970s, but it wasn’t until his seventh feature, Where Is The Friend’s Home (Khane-ye Doust Kodjast?, 1987) that he established his reputation outside of Iran. Like many modestly budgeted Iranian films of those days, including Kiarostami’s earlier works, this film is a child’s story, presumably for the reason that such subjects are less likely to involve social restrictions than would stories about more mature men and women. Since then Kiarostami’s reputation soared, and he has gone on to receive considerable international acclaim for a string of uniquely stylized successes, including Close-Up (Nema-ye Nazdik, 1990), Through the Olive Trees (Zire Darakhatan Zeyton, 1994), Taste of Cherry (Ta'am-e-Gilās, 1997 and winner of the Palme d’Or at the 1997 Cannes Film Festival), The Wind Will Carry Us (Bād Mā-rā Khāhad Bord, 1999), and 10 (Ten, 2002). All these films have been characterized by his signature self-reflexive and long-take cinematography, along with overt invocations of Iranian poetry and mystical philosophy – the summation of which give his films a distinctly intellectual air and which has drawn the admiration of intellectual critics the world over. Indeed, in the fashion of many well-educated Iranians, Kiarostami has multiple cultural inclinations that include poetry composition, painting, and graphical design, and these interests are reflected in those later works. In contrast with those subsequent films, the present film under examination, Where Is My Friend’s Home?, is a more modest and straightforward movie. Nevertheless, I think it is Kiarostami’s most entertainingly satisfying cinematic experience for the viewer. In some ways one might compare Kiarostami to Luis Bunuel. Both of them were obliged to work in conventional commercial formats (in Bunuel’s case, as an expatriate in Mexico), and then both subsequently received accolades that gave them the latitude to try more intellectually adventuresome and personally expressive works. And yet, for both, those early constraining production circumstances may have somehow contributed to their producing their best work. In the case of Where Is My Friend’s Home?, what we have is a deceptively simple little story that seems trivial: an eight-year-old schoolboy has mistakenly taken his friend’s schoolbook and has to return it to him. But this film benefits from not straying far from its straightforward goal that everyone can understand; and that is what carries the narrative along. 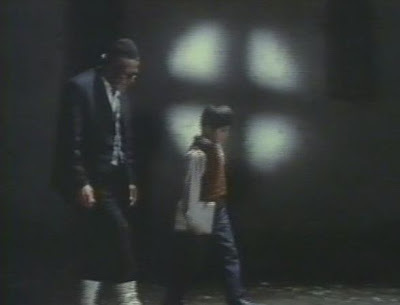 As the film progresses, though, we gradually detect a deeper theme: this boy’s sense of “doing the right thing” is almost continually in conflict with the confusing world of rules and duties that are imposed on him by the adult world. The film narrative proceeds in five parts. 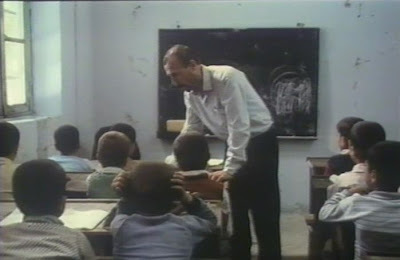 In the small northern village of Koker (Kiarostami would later situate some other films in this village), Ahmed Ahmadpoor and Mohamad Reza Nematzadeh are two boys sitting in the local schoolroom (not surprisingly, boys only) and listening to the stern admonitions of their strict schoolteacher. Mohamad Reza again hasn’t written his homework into his school workbook and is warned that one more such violation and he will be expelled from the school. When the school bell rings and the boys run outside, Mohamad Reza drops his workbook, and in the ensuing commotion, Ahmed mistakenly goes home with both his and his friend’s workbook. At home Ahmed’s mother, busy with housework, continually gives her boy menial jobs and refuses to let him go outside and return Mohamad Reza’s schoolbook. 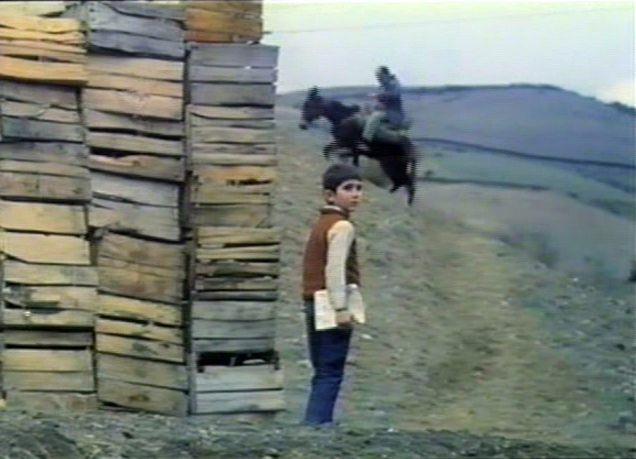 Among the chores, though, is to go fetch some bread from the local bakery, and Ahmed seizes this opportunity to rush outside with the schoolbook in search of his friend’s home, whose location he only knows to be in the neighbouring village of Poshteh. Poshteh seems to be a couple of kilometres away from Koker, and Ahmed runs all the way there to look for his friend’s house. As Ahmed runs across the countryside, the viewer gets a feeling for the pastoral life in this locale. Once in Poshteh, Ahmed asks around, and we see that the adults have little time to pay attention to the questions of an 8-year-old boy. But by luck Ahmed happens onto a classmate who lives there but who only knows where Mohamad Reza’s cousin Hemmati lives. When Ahmed finally finds that house, though, he learns that Hemmati has just gone off to Koker. So now Ahmed has to run all the way back to Koker. As he runs past a storefront in Koker, Ahmed passes by his grandfather, who sternly questions why the boy has gone outside the village. Afterwards, when Ahmed is out of earshot, the grandfather tells an elderly friend that all young people need to be continually disciplined in order to grow up properly. In fact, he says, it is generally good for a boy to be beaten every two weeks, come what may, whether he has misbehaved or not. A tradesman shows up at the storefront, and during a bit of rural local color as the man tries to hawk his iron doors, Ahmed overhears the surname Nematzadeh mentioned and tries to speak to the man. But here, as elsewhere, the adults pay no attention to the boy other than to give orders and recommend punishments. The tradesman brusquely gets on his donkey and heads off to Poshteh, with Ahmed, thinking that he may have found Mohamad Reza’s father, in hot pursuit. 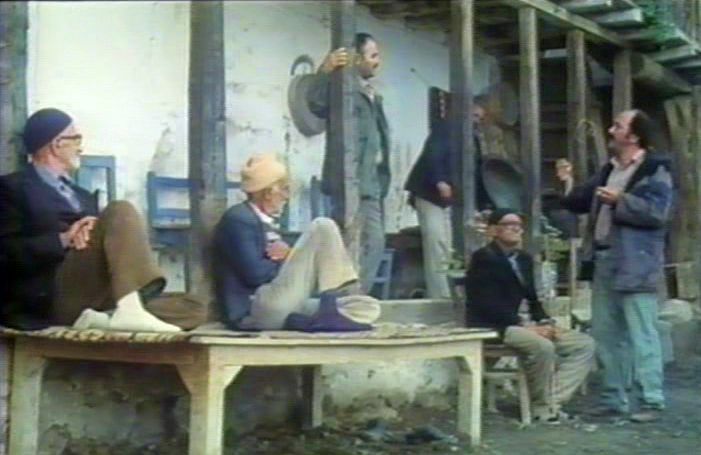 Back in Poshteh, Ahmed finally finds the tradesman’s son, but it is not Mohamad Reza. By this time it has become dusk, but Ahmed does manage finally to find a man who will talk to him and who promises to show him his friend’s house. 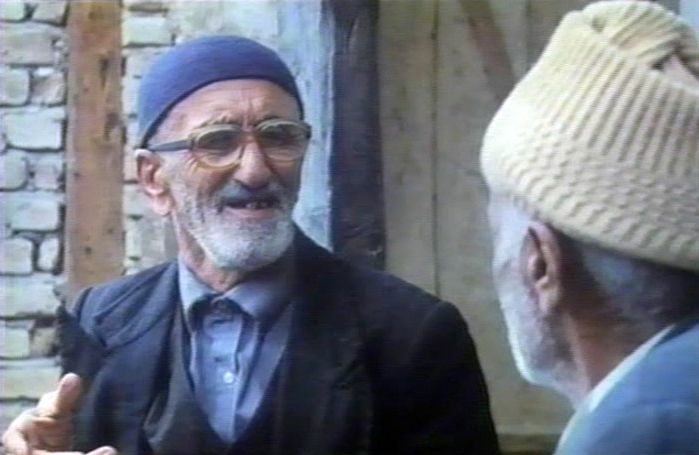 But it turns out that this is an old man who just seems to be looking for anyone to listen to his tales about the virtues of his former craft, making traditional wooden doors, which, he complains, are now everywhere being foolishly replaced by the more “modern” iron doors, even though the traditional wooden doors (a symbol for the traditional Iranian ways that are being replaced by imported modernity) are more beautifully crafted. Although this old man is friendly, Ahmed begins to suspect that the man just wants a listener and doesn’t really know where his friend lives. He finally discontinues his quest and runs all the way back to Koker in the dark. Back at home, Ahmed’s parents are occupied with their own routines and again pay no attention to him, and he still hasn’t done his own homework or managed to do the right thing by his friend Mohamad Reza. But a schoolboy who has spent the whole day trying to solve a problem is not just going to give up just like that. You can see the film, yourself, to find out how things turn out the next day in school. Kiarostami’s cinematography is straightforward and intuitive in the film. The focalization is almost entirely that of the boy, Ahmed, and we see everything from his anxious perspective, where things that may seem trivial for adults can have considerable magnitude. To maintain this sense of immediate involvement, Kiarostami doesn’t employ the long, fixed-camera takes that characterize his later films. Here instead, the visual continuity is well motivated, and even the many shots of Ahmed running across the countryside are smoothly and naturally executed. There are some interesting moral issues in Where Is The Friend’s Home?. Ahmed is always utterly sincere and instinctively honest towards everyone. But sometimes there are higher principles than literal honesty. His ultimate goal is one of compassion: to help his friend, Mohamad Reza, and this is manifested in Part 1 when he helps his friend after he has fallen down and dropped his schoolbook. In so doing, though, he accidentally walked away with his friend’s schoolbook, and now his primary goal is to return the book. This is not just to expunge his own guilt, but represents a continuation of his sincere concern for his friend’s vulnerability of expulsion from school. Adherence to this higher goal trumps more mundane rules that one follows. So although he is instinctively honest, Ahmed, in pursuit of the higher good, does hesitantly make compromises with literal truth at several turns. In Part 1 he is supposed to get bread and pretends to do so, but instead rushes off to Poshteh with his friend’s schoolbook. Later in part 4 he effectively lies to the old man by implying that he has found his friend’s house and returned the book. And there is still one further lie to come. Thank you for the review. I could not understand what exactly happened with the old man (locksmith/ man who made windows and doors) because of the poor subtitles,but did get a drift of what was happening. What I liked the most about the movie was the earnestly of the boy in doing the right thing,each time he is at crossroads.Also, the movie is a like a book in motion.Such a splendid job by the entire cast and crew! On a different note,it pains me to see how many cultures believe in letting the stick/cane discipline the child. It is up to us,the adults, to not let history repeat.Because we were wronged, does not me we do the same to our next generation. A sensitive topic, very fleetingly and subtlety broached in the movie, somehow lacks the force to drive the point home.Perhaps, I was not too receptive of it,or maybe that was never the intention of the film-maker to begin with.